Regarding all the recently reviewed raw converters you're probably asking yourself what never-ever-heard-of software is next on the list. Well, here we go - it is Raw Therapee (let's call it RT from here). 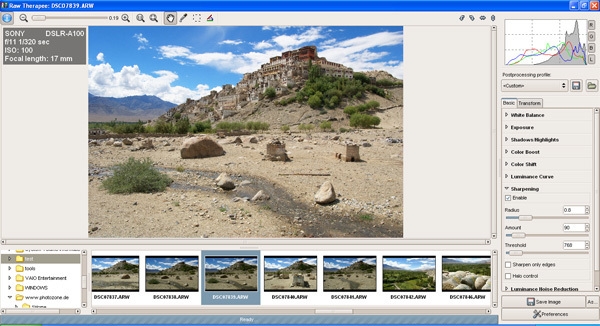 As you could almost conclude from the odd name (short for THe Experimental RAw Photo Editor) it is a freeware product available both for Windows and Linux. It is based on an enhanced DC Raw engine which is used by several open source products such as the popular "The Gimp". DC Raw and therefore also RT supports the vast variety of RAW-enabled digital cameras. There's no real workflow concept in RT - the application is purely file-based and does neither offer photo organization functionalities nor batch-processing. Once you've selected a directory in the file system viewer the application will generate thumbnails for the containing images. You can then choose and modify images on an individual basis. Intermediate results are stored in a dedicated ".pp2" file per image so you can pick up your work again whenever you want. The processing speed of RT is very fine regarding the thumbnail generation but, frankly, extremely slow regarding the imaging aspects - it seems that operations are always performed on the complete image rather than just on the visual portion so you better have a very fast machine (e.g. my 1.1GHz sub-notebook is not really up to the task). All correction controls are organized via tabs and corresponding sub-sections on the right hand side of the window. The controls are usually based on sliders and check-boxes. Some of the controls for shadow- and highlight-corrections seem to be a bit randomly spread across three exposure-related sections - this could be better structured. Typical for most open source/freeware projects the documentation is a bit on the slim side - reads here: it does not exist within the application (see the RT homepage for some explanations) and something like an "edge tolerance" of 1000 or a "saturation limit" of 5000 isn't really self-explaining for instance. RT may be a freeware product but its de-mosaic algorithm is good enough to embarrass many of the commercial products (Hallo, DxO and Bibble, somebody home ?) except Adobe and RawShooter (now ceased by Adobe). The resolution/noise ratio is also top-notch whereas the supplied noise reduction is about in-line to what we've seen from the rest of the gang. As already hinted above the exposure correction controls are extensive and a somewhat unordered. Nonetheless they're easy to master and well sufficient for the vast majority of scenes once you got used to the philosophy. Don't expect wonders from its rather basic auto-correction though. Color manipulation is available from the usual white- and color-balancing to "Color Boosting". Color boosting allows you to manipulate color saturation either globally or independently for the A and B channel of the LAB color mode (L=Luminosity, A-channel=green-red, B-channel=blue-yellow). The tool is also able to detect and avoid color clipping. All-in-all the color controls work reasonably well though some other tools offer a little more here. Lens flaw correction is limited to basic manual distortion controls and CA reduction. Regarding its processing speed problems and lack of some features (batch processing, image organization aspects) Raw Therapee is not yet up there with the big boyz. However, when looking at the possible output quality achievable with RT you must be surprised how well it keeps up with the competition. The de-mosaic and sharpening quality even resides with the best available out there and remember ... RT is freeware! For occasional RAW users the product is certainly good enough already ... assuming you have a very fast machine at hand.